Star Shields and his crew of artists perform innovative airbrush art on living canvases- transforming people into amazing and unique art masterpieces. 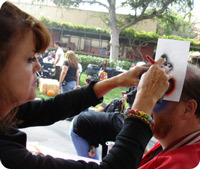 We have brought face painting to a higher level of fine art. Each subject we paint is a living canvas of beauty, bold color and design. Star has been airbrushing everything from T-shirts, walls, guitars, surf boards, cars & graphics since 1961. 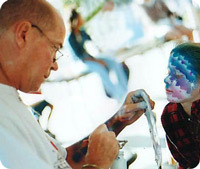 Since 1979, airbrush face and body art has grown into a worldwide phenomenon. He has taught this art technique to many artists that now have successful body art businesses running in Australia and Hollywood. Star's passion for this art form can be seen in the thousands of faces he has painted throughout his colorful art career-- and it keeps getting better and more fun all the time. Michelle Ries has a B.F.A.in Painting from The Kansas City Art Institute. In partnership with Star Shields, they created this State-of-the-Art combination of Airbrush Tattoo and Body Painting. Since 1990, Michelle has been the driving force behind developing a waterproof ink for temporary tattoos. In 1999 and 4 more times after, Michelle sent Star to Australia where he worked with Stephen Clark (Airbrush Body Art founder) to make the inks a reality. Today, Michelle's idea has become a world-wide craze. Donna learned to paint Airbrush T-Shirts in 1973 from Star Shields at the "Rainbow House" art colony. She and the other artists painted "rounds," which consisted of up to 24 various types of shirts on boards. They started with Red/Violet and went thru the rainbow colors utilizing stencils and laces. Donna has an AA in Computer Graphics and studied classical painting, drawing, sculpture and multimedia in Art School. She has a Bachelors degree in Illustration and is a current participant of the Spanish Village Art Center in Balboa Park. Her recent work includes oil paintings of surfers. 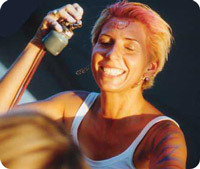 Lovely Linda has been with the Airbrush Face and Body Art team since 2002. Her creativity comes from a background of arts and crafts since she was a child. She studied Fashion Design in college and minored in art. She adds her graphic art talents to the team by helping to create new designs. 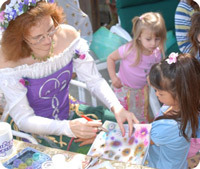 Linda had her debut as "The Tattoo Faery" at Sawdust Winter Fantasy in Laguna Beach California in November of 2005. After 30-plus years in new construction and remodeling, Mike turned to the art world. In 1996, he rode an art bike with the Banana Bike Brigade- the world’s largest art car parade- in Houston, TX. With his construction and welding experience, Mike embraced the art bike concept and built many bikes. In 2001, Mike started learning airbrush techniques from Michelle Ries and has worked with her on many parties and events including "Cats" at The Fabulous Fox Theater and "Peter Pan" at The Mun Opera (both in St. Louis, Mo.) Mike also builds the booth for Star at The Sawdust Festival.